5:30pm this evening, 28 October 2011. 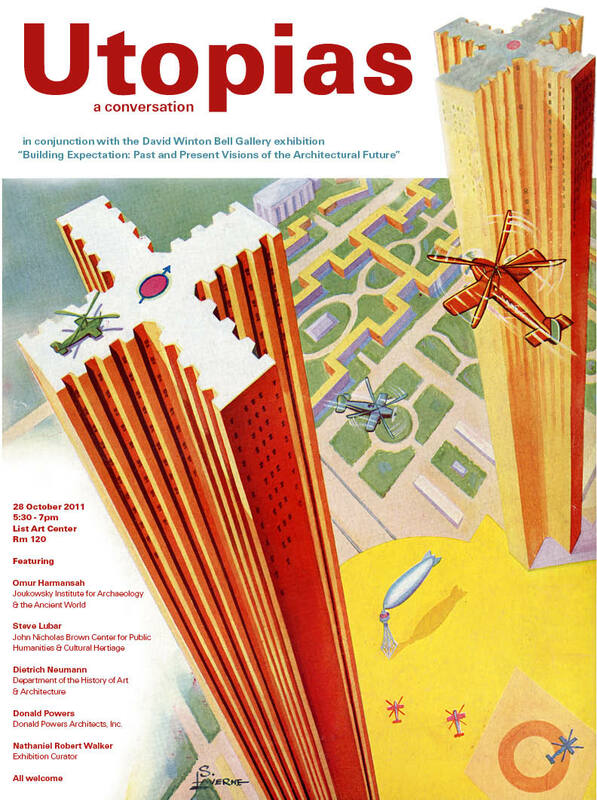 A panel conversation responding to the Bell Gallery’s current exhibition “Building Expectation: Past and Present Visions of the Architectural Future”. An interdisciplinary conversation between local architects and members of Brown’s faculty moderated by the exhibition curator, Nathaniel Robert Walker, the panel will be a unique opportunity to explore some of the pertinent questions regarding the imaging and imagination of our futures (both past and present) arising from the current exhibition. Building Expectation presents a collection of historic and ongoing visions of the future from the 19th century until the present day. The focus of the show is less upon canonical designers or art-historical movements and more upon broadly based, popular speculation in the public sphere. According to exhibition curator, Nathaniel Robert Walker, “The world of tomorrow has usually been imagined first and foremost as a place – the new Promised Land, the millennial landscape. And architecture, cast since the Enlightenment as the calling card for cultural and technological periods in the grand narrative of human development and progress, has always been one of the future’s most revealing and recognizable features.” The exhibition’s content has been drawn from a number of university libraries and private collections, as well as the Swiss state-supported museum of utopia known as the Maison d’Ailleurs (House of Elsewhere). Many of the objects in the exhibition have never been exhibited in the United States.